ANGILBERT, a friend and confidante of the Emperor Charlemagne (r. 768–814), and student of the eminent Anglo-Saxon scholar/educator Alcuin (†804). St. Angilbert’s Latin poetry earned him the nickname “Homer”. He married Charlemagne’s daughter Bertha, but with her blessing he received monastic tonsure, with Bertha following in his footsteps. As a reward for his service, Charlemagne gave St. Angilbert the Abbey of St. Riquier, where he served as abbot, until his repose in 814. COLMAN of LINDISFARNE, our father among the saints Colman of Lindisfarne was a monk of the seventh century Church of Scotland and Ireland. He led the Celtic party at the Synod of Whitby. His defence of the Celtic rite led to his identification as the Last of the Columban Abbots of Lindisfarne. Born in Connaught, Ireland little is known of his early life. St. Colman was tonsured a monk at Iona, was a disciple of St. Columba (9th June) and a contemporary of SS. Finian (16th March) and Aidan (31st August). Following the repose of St. Finian, Colman was chosen to succeed him as the third Abbot/Bishop of Lindisfarne. Noted for his austere and zealous life, and held in high repute for his sanctity, his episcopate was an exemplar of frugality and simplicity of living, as well as the devotion of his clergy to their responsibilities of preaching and ministering to the faithful. St. Colman’s defence of Celtic tradition and reluctance to yield to the Roman rite fixing the date of Easter (vide Paschal Controversy) led to the Synod of Whitby. Though he put forth an eloquent defence, King Oswy made a royal decision to follow the Roman practices. This was a decision that was met with general acceptance, but one, which St. Colman could not accept, resigning from his See. St. Colman left for Iona with all the Irish and thirty English monks from Lindisfarne. He remained in Scotland for about three years, establishing several churches, and then returned to his native Ireland with about thirty Irish and English monks. They settled on the island of Inishbofin in Co. Galway where St. Colman established a monastery and school. In time, friction developed between the Irish and English monks; St. Colman resolved this by taking the English monks to the Irish mainland, where he established a monastery which he called Mayo of the Saxons, which went on to become an important centre of sanctity and learning, and in time an Episcopal See. St. Colman returned to Inishbofin, where he reposed 675. ETHELINA (EUDELME), (Date Unknown), St. Ethelina is the patron saint of Little Sodbury in present-day Gloucestershire. No further information, including the dates she flourished, is extant. HELLADIUS of TOLEDO, though he served as a minister in the court of the Visigothic Kings, St. Helladius true calling was monasticism. He often visited the near-by Abbey of Agali, and in time resigned his position at court, and received monastic tonsure at Agali. In 605 St. Helladius was made Abbot of Agali, and in 615 he was consecrated twenty-sixth Archbishop of Toledo. St. Helladius served the Archdiocese of Toledo until his repose 632. LUCIUS, SILVANUS, RUTULUS, CLASSICUS, SECUNDINUS, FRUCTULUS, and MAXIMUS, (Date Unknown), a group of martyrs in North Africa of whom nothing besides their names is known. 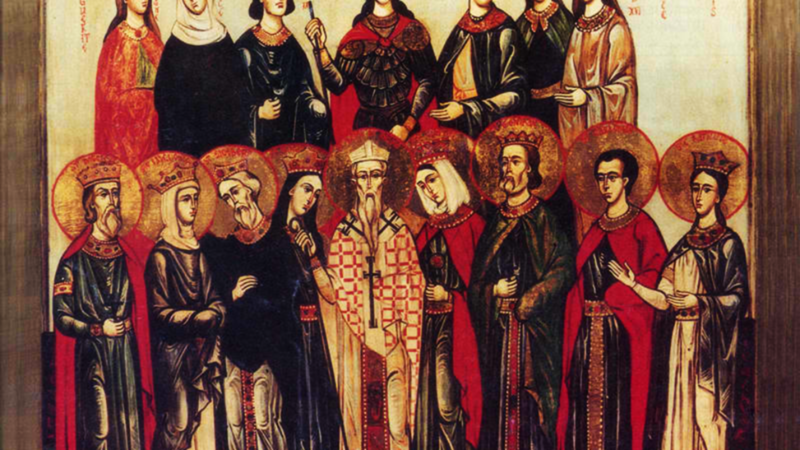 MAXIMUS, CLAUDIUS, PRAEPEDIGNA, ALEXANDER, and CUTIAS, a group of martyrs in 295 in Rome during the Diocletianic Persecution of whom nothing further than their names is known.